It was a mixed week for US equity indexes, with net weekly changes ranging from +0.52% (Trans), +0.47% (Nasdaq comp'), +0.29% (R2K), +0.17% (Dow), +0.05% (SPX), to -0.31% (NYSE comp'). The sp'500 saw a net weekly gain of 1.3pts (0.05%) to 2707. 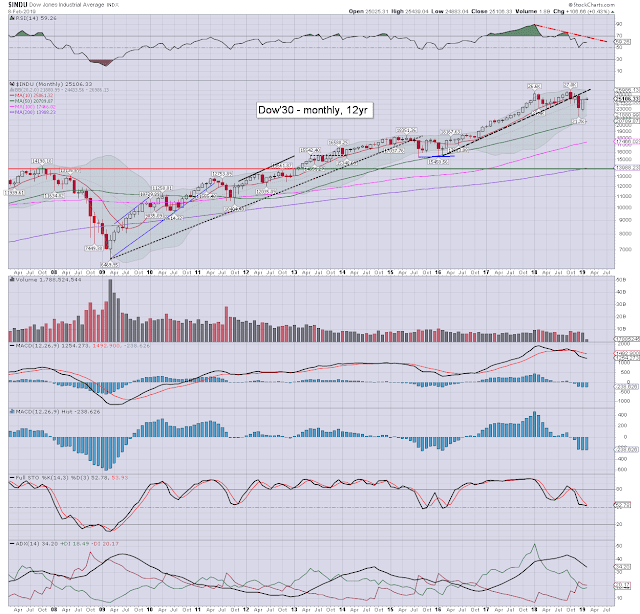 There was a new multi-week high of 2738, just fractionally shy of the key 200dma. More broadly, the spx is currently net higher for February by 3.8pts. 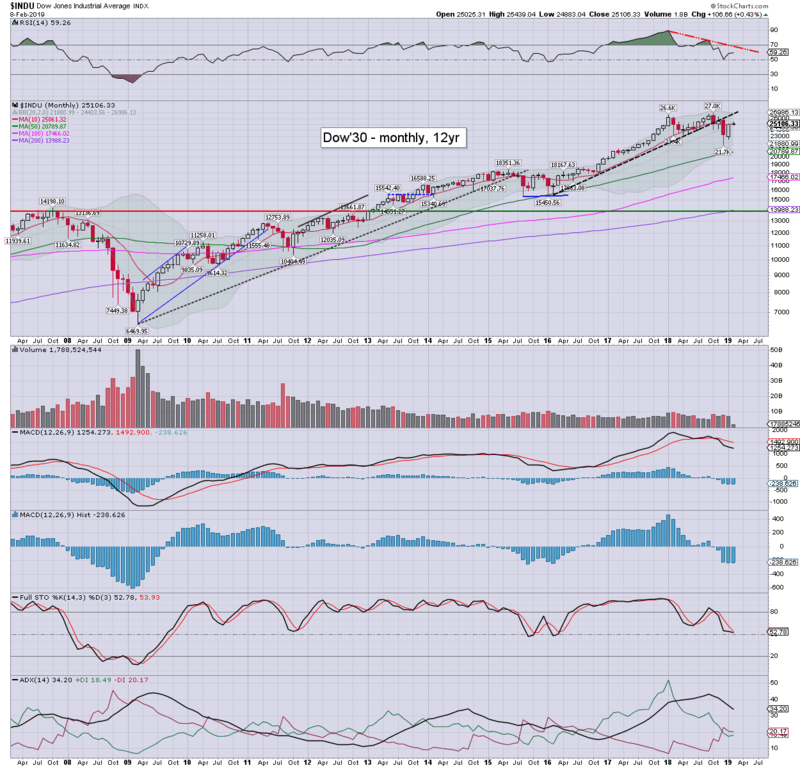 Note the key 10MA at 2744. Underlying macd (blue bar histogram) cycle remains on the low side, as m/t price momentum still favours the bears. 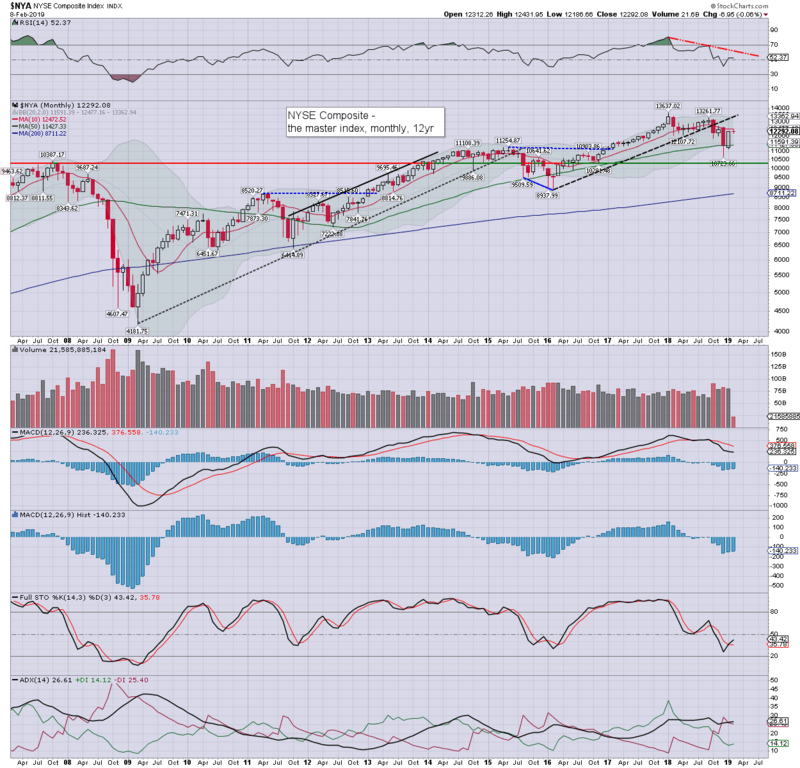 Whilst it could be argued the market might broadly climb for the rest of the year, the bears could equally argue recent price action is analogous to April/May 2008. 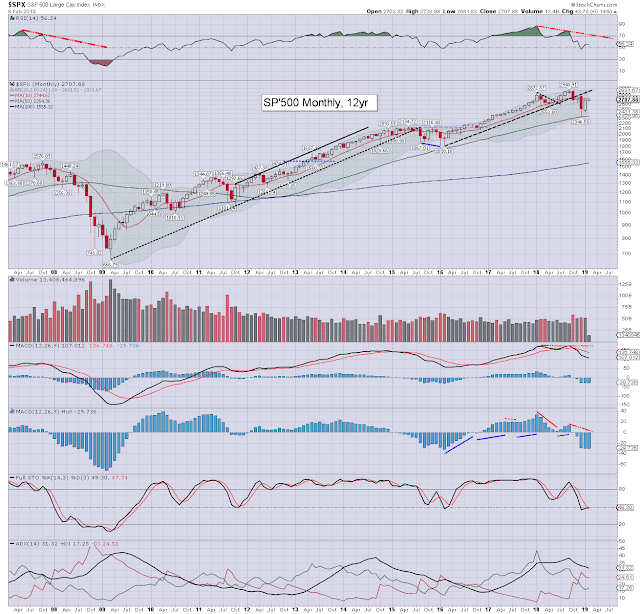 Best guess: no monthly close above the key 10MA or 200dma. Equity bears need to see a break back under the January low of 2443 to have confidence the m/t bearish trend will remain intact. Many other world markets are supportive to that notion. 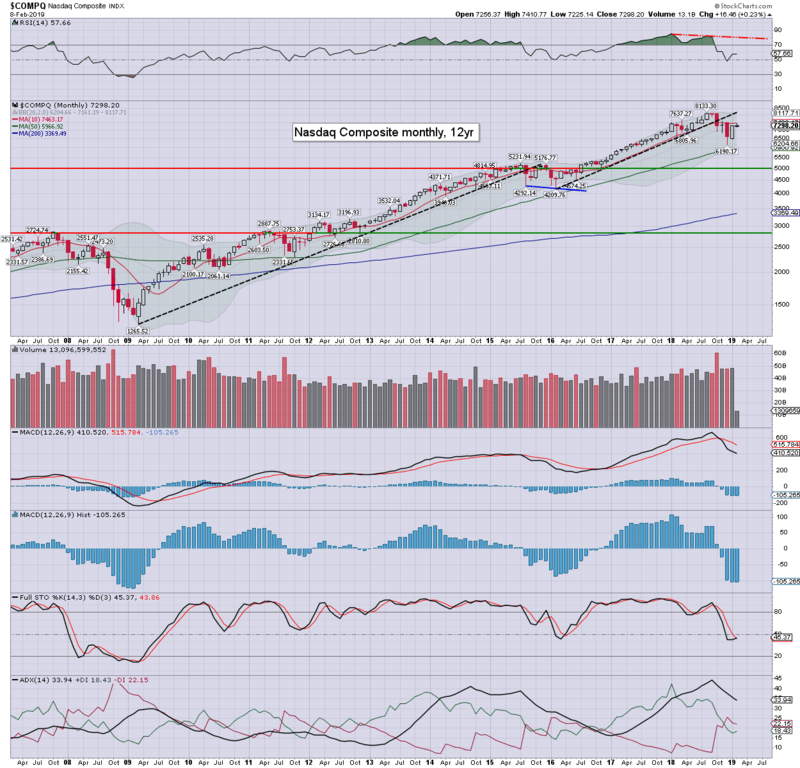 The Nasdaq saw a net weekly gain of 0.47% to 7298. More broadly, tech is holding under the key 10MA. Price momentum remains at levels last seen in early 2009. The mighty Dow saw a net weekly gain of 0.17% to 25106. The Dow is the only index currently trading above the key 10MA. 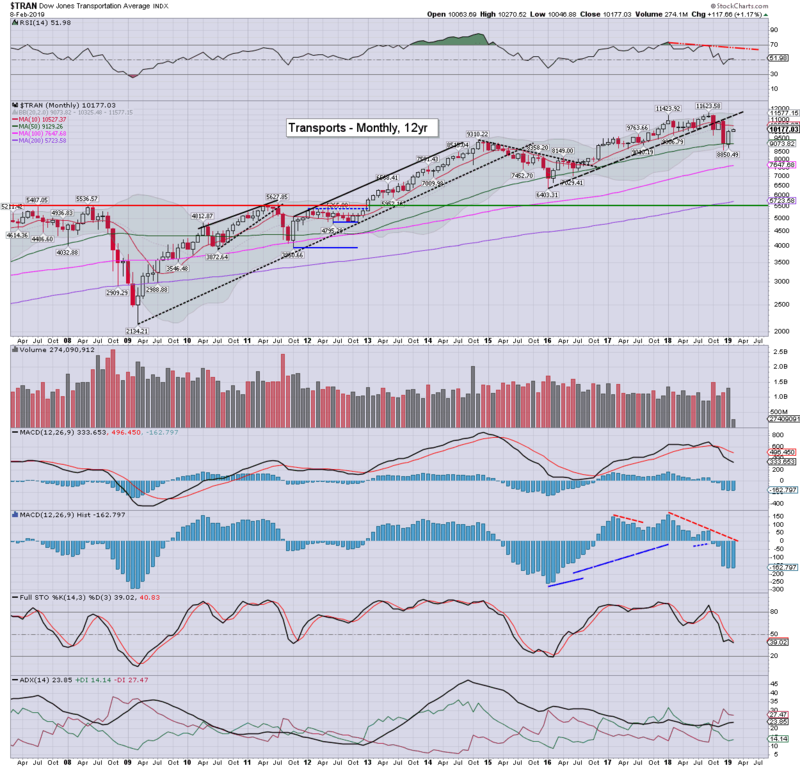 The master index saw a net weekly decline of -0.31% to 12292, notably just under the key 10MA. 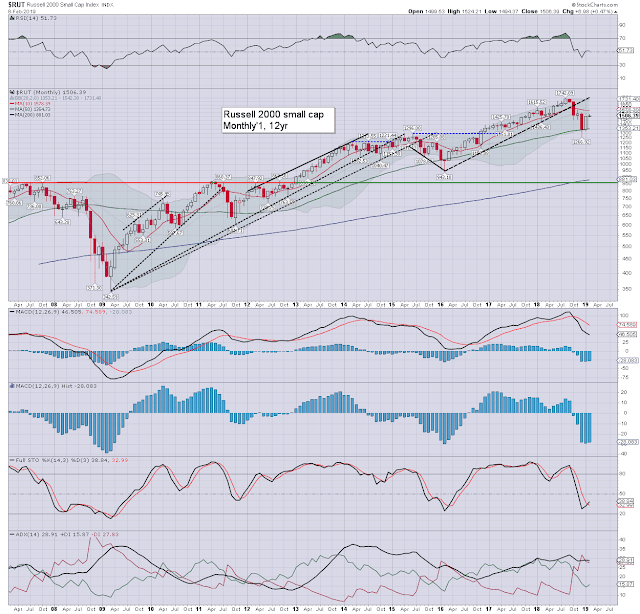 The R2K saw a net weekly gain of 0.29% to 1506, still 4.8% below the key 10MA. The 'old leader' - Transports, saw a net weekly gain of 0.52% to 10177. 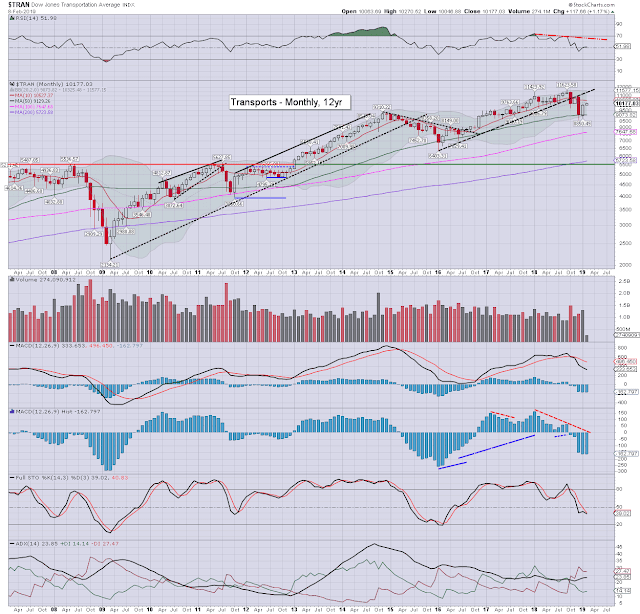 More broadly, the trans is net higher for Feb' by 1.17%, but still under the key 10MA. Five indexes were net higher for the week, with one net lower. The Trans and Nasdaq are leading, with the SPX and NYSE comp' lagging. 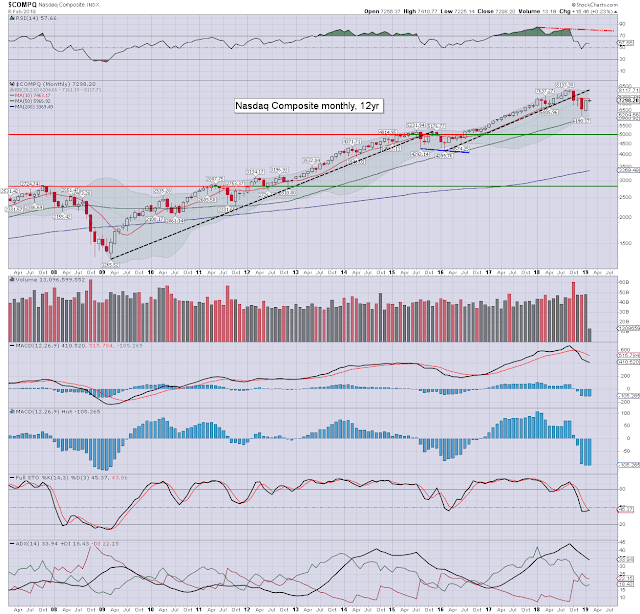 More broadly, five of six indexes remain under their respective 200dma and monthly 10MA, with the Dow being the exception. 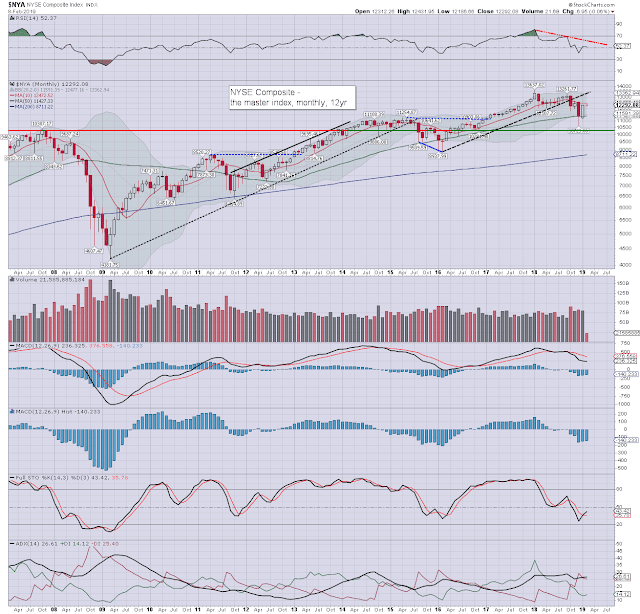 The m/t trend remains outright bearish, but the current situation is clearly borderline. The R2K continues to lead, currently +11.7% for the year. The Transports are +11.0%, with the Nasdaq comp' +10.0%. The NYSE comp' is +8.1%, the spx +8.0%, and the Dow lagging +7.6%. T - Weekly jobs, PPI, retail sales, bus' invent'. Thursday will see first print for German Q4 GDP. If it comes in negative (as seems probable), it'll make for the second consecutive quarterly decline, and deem the economic powerhouse of the EU as in recession. Where Germany goes... the rest of the EU can be expected to follow. **As Monday 18th is CLOSED, I would expect higher volume ahead of the three day break. Friday Feb'15th will be further complicated by it being OPEX, which will inherently lean to chop. Since late December, its become clear, the fed are planning to cut/adjust QT. If equities unravel into early/mid March, then we'll see that first cut announced at the March 20th FOMC. No doubt, equities would rally on such monetary easing. Further, a QT cut will be a pre-cursor to a rate cut. Again, equities could be expected to initially rally on such a rate cut... much like Sept'2007. Yet... a rate cut would be the ultimate equity sell signal. Most would disagree with that, but then most seem to have little memory of events from the collapse wave of 2007/09. If you value my work on Blogger and Twitter, subscribe to my intraday service.